It’s coming… Saturday 8th June 2019! 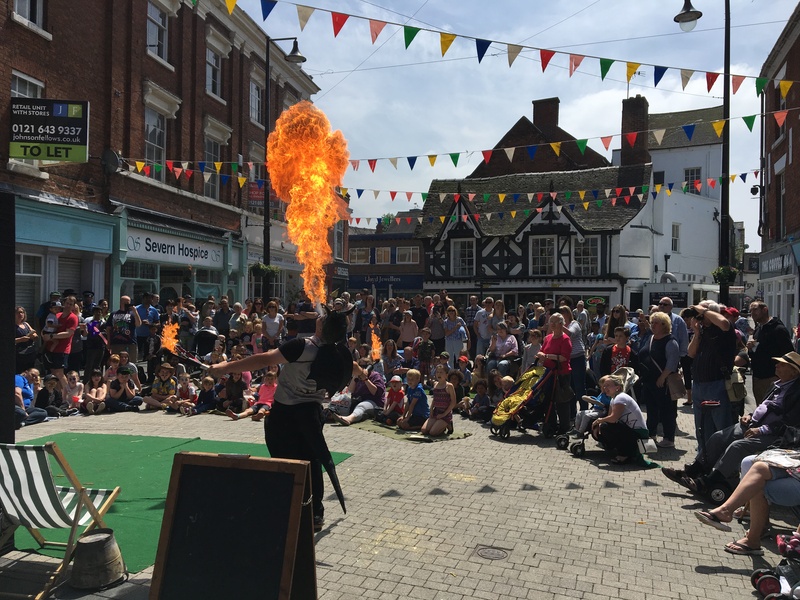 The Midsummer Fayre is a fire-eating, foot-tapping, feel-good spectacular that takes place annually on the second Saturday in June, 10am – 3pm around Wellington’s Market Square, All Saints Church and Market Hall. Organised by Wellington H2A and All Saints Church, it is funded with support from Wellington Town Council and local businesses, and sees thousands of people coming out to enjoy the town. With around 40 stalls set up outside the parish church, music and dancing throughout the day and a costumed procession first recorded in 1773, its a day no Wellingtonian should miss! NEW SPONSORS NEEDED! Could your business help us put on the biggest show of the year? This year we’re looking for a new lead sponsor to help us host this popular annual event. For £500 you’ll get your name up in lights (well, a nice bold font at least) on our all our full-colour posters and our thousands of programmes (see below), plus an advert on the back page; lots of mentions in our press releases, website and social media posts, and a stand at the Fayre itself. Maybe some of your employees would like to don a costume and join the procession? We’ll also throw in four free tickets (worth £40) to our after show party – the ceilidh & barbecue night at Wrockwardine Village Hall! You’ll be supporting one of the biggest free events in the town’s calendar and one which really does show Wellington at its best. We’re also looking for two businesses to be one of our £250 sponsors, which will get you included inside the programme with an advert, as well as in lots of online mentions, a stall at the Fayre, plus 2 tickets to the ceilidh (worth £20). The sponsorship is mainly needed for the Fayre, but we’ll keep celebrating our sponsors throughout 2019 and into Charter Day (March 2020) when our new project year begins. DETAILS OF THE 2019 PROGRAMME COMING SOON. June fayres were taking place in Wellington at least as far back as the 13th century, when the town’s Market Charter of 1244 sanctioned a fayre to take place on the Vigil, Feast and Morrow of St Barnabas (10th-12th June). An important commercial event in Wellington’s calendar, it is likely that street entertainers would have been there to make the most of the large crowds and long hours of daylight – just as they are today. Five hundred years later in the 1770s, the June fayres were still taking place, but the town’s most colourful annual celebration seems to have been the Wellington Jubilee. This was staged slightly earlier in the year at Whitsun, and was advertised in the newly established Shrewsbury Chronicle newspaper from 1773 – 78. Described then as an ‘ancient festival’, it perhaps dated back much further. It comprised ‘a breakfast of tea, coffee and chocolate’ on The Green (the area just north of the parish church), followed by a costumed procession through town and, at night, a ‘Ball and Assembly’. 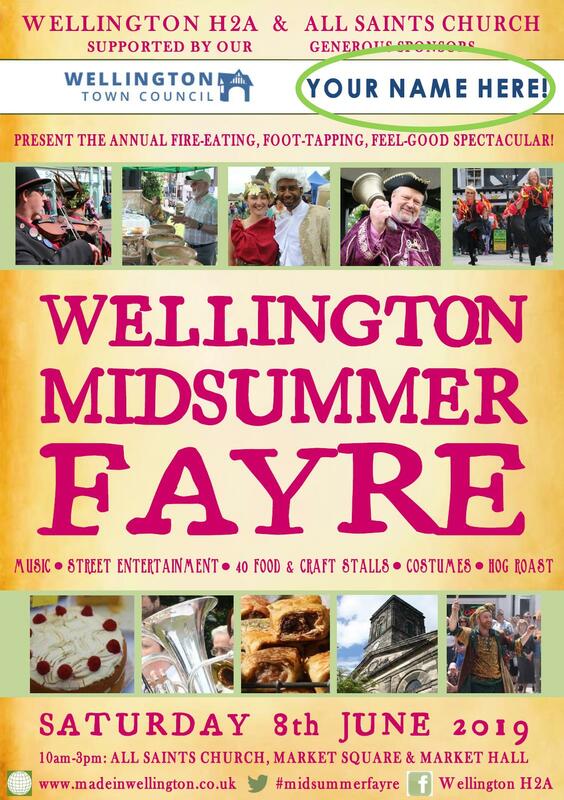 It is from these past fayres and Jubilees that today’s re-vived Midsummer Fayre takes its inspiration, stirring together six centuries of festivities and folk culture from the 13th to the 19th centuries, when Wellington’s June fayres disappeared.